Woolly Wombat and Bandicoot are best friends. They live together, eat together and have fun together. But sometimes, as most friends do, they also get cross and fight with each other. Woolly Wombat is an endearing character. He and Bandicoot have a relationship which is just like a sibling relationship. Any child with a brother, sister or close best friend will probably relate strongly to this tale of friendship, fighting, and making up. While this is a simple concept and story line for beginner readers and young children, the beautiful, expressive illustrations also portray a little more going on. These clever pictures enhance humour in the story and engage the reader further. 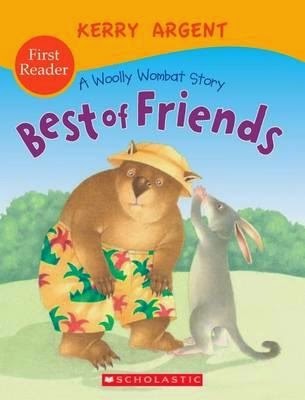 This book, like the three other Woolly Wombat stories, is fun and attractive. The slimness of each book, the themes explored and the simplicity and sparseness of the words used make them perfect first readers.